Does your dog’s daycare or boarding kennel require a bordetella (kennel cough) vaccine before they’ll accept your dog at their facility? What about your groomer or trainer – or even your vet? These days it seems that just about anywhere your dog goes, they’re asking you to vaccinate him against kennel cough. And now some facilities are asking you to get canine influenza shots as well! …. the vaccines just don’t work very well. About a month ago, the press reported an outbreak of severe canine respiratory infection at a kennel in Windsor, Connecticut. About a dozen dogs came down with a cough … and one dog developed pneumonia and died. And, guess what? The kennel requires kennel cough vaccines, so all the dogs who came down with the illness had been vaccinated against bordetella! There are countless examples of dogs being vaccinated for kennel cough and then getting sick anyway. It happens every day at shelters, where dogs are often vaccinated when they arrive and then a few days later, they’re diagnosed with the disease itself. And it happens at daycare, training and boarding facilities even if 100% of their clients have been vaccinated. Unfortunately, there are at least 40 agents that cause kennel cough … but the vaccine only addresses two of them. Check out these quotes from a forum on kennel cough after an outbreak in Chicago last year. I mentioned earlier that there are other problems with the kennel cough vaccine, besides the fact that it’s not very effective. When dogs are vaccinated for kennel cough, they shed the disease for up to seven weeks afterwards … so the vaccination actually contributes to the spread of disease. So when you send your dog to doggy daycare or boarding and he’s recently received a bordetella shot, he’s not only quite likely to catch kennel cough despite being vaccinated, he may also be passing on the disease to other dogs at the kennel. Another issue is that it’s not very safe. Every vaccination comes with risks, and bordetella is no exception. Short term reactions to the vaccine can include coughing, sneezing or a stuffed up nose, similar to the disease itself, as well as swelling at the injection site, nausea, vomiting or diarrhea. There are also longer term risks. According to Dr Patricia Jordan, conditions like collapsing trachea, irritable tracheas and pneumonia are all complications of not only kennel cough but also the bordetella vaccine. This is because bacterial vaccines like bordetella become incorporated in the genes and can replicate and awaken as a more serious disease. Vaccination of any sort also elevates histamine, which can promote cancer and chronic inflammation. Here’s some more detailed information on problems with the kennel cough vaccine. Probably the most eye-opening experience was in my own kennel. In the sled dog racing world, kennel cough is quite a common threat, destroying many dreams and wasting hard training, when your entire dog team gets swept off their feet by this illness. Because it’s highly contagious, escaping it once you’ve already entered a race where hundreds of dogs share common ground is literally impossible. As mushers we’re constantly reminded by vets to vaccinate our canine athletes against kennel cough and some race organizations won´t even let your team start unvaccinated. … they experienced lethargy, loss of appetite, vomiting and even diarrhea. I swore I would never do it again. We had a mixed group of dogs. Some were vaccinated with a combination vaccine that included kennel cough, others had only the combination vaccine, some had expired vaccinations and some had never been vaccinated against any disease. The entirely unvaccinated dogs showed NO symptoms of the disease. The vaccinated dogs all had various levels of symptoms, from severe respiratory symptoms to just being tired. That was a clear sign of how the strength and capability of my dogs’ immune systems had been affected by the vaccines they’d had. 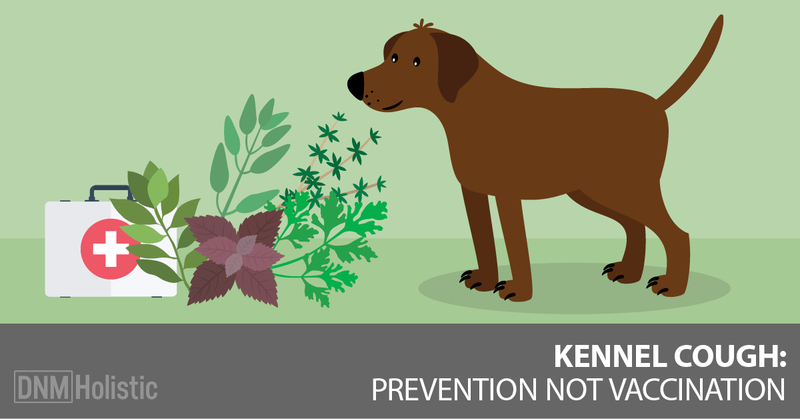 Spring and summer are the seasons when kennel cough seems to happen more often. One reason is that people travel over spring break and the summer holidays so more dogs are boarded in kennels while their families are away. But in the northern hemipshere, at least, it seems that changeable weather – warm temperatures one day and back to snow and ice the next – can also make dogs more susceptible to catching contagious diseases like kennel cough. I’ve noticed this with my sled dogs, who live outdoors. Outdoor dogs are more used to the cold, but the long months of winter can be draining to their immune system. I find that making adjustments to their diet at this time of year helps keep them in great shape, and I’m going to share some of my favorite nutritional supplements with you. If you’ve read this far, you’ve realized that vaccinating your dog against kennel cough isn’t a good solution, and may even harm your dog. Fortunately, you have a choice. Look for a facility that doesn’t require the kennel cough vaccine. They do exist! Do some research – ask your friends, talk to other dog owners you meet at the park – and find them! If you can’t find anybody in your area who understands that kennel cough vaccination is a bad idea, then look for a dog-sitter or walker to come to your home instead. As a last resort, if you really can’t find another solution, ask your kennel, daycare facility, trainer or groomer if you can sign a waiver for kennel cough. Usually, what they’re worried about is your dog catching the disease at their facility, so if you agree in writing not to hold them liable, they may agree to waive the vaccination requirement. Your dog’s immune system starts with a healthy gut … so start by feeding your dog the best food you can afford – preferably a fresh, whole foods, raw meat based diet. Then, add some herbs and spices to his food to help boost his immune system and keep him healthy and strong as the seasons change. Here are my top 6 herbs to help prevent kennel cough and other contagious diseases, especially during changeable weather in spring. Don’t miss the recipe I’ve provided at the end! It’ll provide you with dosage amounts and is a great way to blend these herbs for your dog. This common household vegetable is one of the best foods to support your dog’s immune system. It contains antioxidants such as vitamin A and minerals like sulfur and zinc. It also provides a wide range of B vitamins. Besides its nutritional benefits, garlic has powerful antiviral, antibacterial, anti-inflammatory and anti-cancer abilities. It acts as a cardiovascular tonic and is a known immune system enhancer. 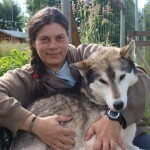 I’ve had very good experience with feeding garlic to all my geriatric retired sled dogs for their overall good health and wellbeing. You can feed garlic raw (chopped or crushed) or dried in a powdered form. According to traditional Chinese medicine, cinnamon is a warming and drying herb. Like garlic, true cinnamon has strong antiviral, anti-inflammatory and anti-bacterial properties, and acts as an antioxidant. On top of that, it’s known as one of the world´s most powerful natural antibiotics. Because of its antifungal properties, I’ve found it very helpful in treating one of our dogs, Balto, who suffered from long term eczema caused by yeast. At our kennel, we also use cinnamon for our geriatric huskies to successfully keep arthritic symptoms including pain at bay, and as a general blood tonic. In times of flu or even kennel cough, true cinnamon helps to dissolve mucus and generally strongly boosts the immune system. Caution: Please be careful when purchasing cinnamon for your dog. While true cinnamon is safe for your dog´s liver when used frequently and in higher doses, its cheaper relative, cassia cinnamon contains high values of coumarin, a substance harmful to the liver. Unless the bottle or bag clearly states the botanical name Cinnamomum zeylanicum, you can be sure it’s not true cinnamon. Buy at specialized herb shops or herbalists. 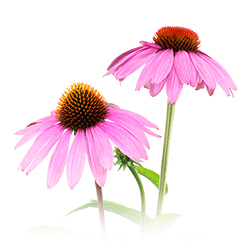 Echinacea is well known as a highly effective immune stimulant. It has the ability to help fight off disease in times of need, including the colder weather, changing temperatures of spring time, or when your dog is exposed to kennel cough and other contagious diseases. It has also antimicrobial properties that make this herb a perfect immune boosting ally. I add echinacea to many of my herbal blends for dogs of all generations, activity levels and health conditions. I have this herb on hand in a dried form or as a tincture at all times, so I’m ready when I need it for my dogs. Rose hips are one of the best natural sources of vitamin C, making them a great addition to any immune-supporting all natural supplement mix. In my experience of feeding rose hips to our older dogs as well as our athletic dogs in full training, I have never come across a case of diarrhea like dogs can get when fed large amounts of synthetic vitamin C. The synergy of compounds in rose hips make the vitamin C perfectly bioavailable so you can provide it to your dog without concern when he needs an immune boost. Ginger is another warming, drying and tonifying herb. It supports the heart, stimulates the immune system and has strong antiviral, anti-inflammatory, antibacterial properties. Thanks to its anti-inflammatory ability, ginger is a very suitable supplement for elderly dogs and those suffering with arthritic pain. You can use grated fresh ginger root or powdered ginger. Chamomile is known mostly for its calming effects, both on the nervous system and digestive tract. However, it also possesses strong anti-inflammatory and antimicrobial properties and helps with wound healing. Because it is a safe and gentle tonic that supports the digestive tract and liver, I like adding chamomile to my herbal formula. I developed this warming and immune system boosting formula and use it for all my senior dogs, puppies and any others who need it. Mix all ingredients thoroughly in a glass jar, close tightly and store in a dry place away from direct sunlight. *You can also opt for using fresh garlic and ginger instead of the powdered versions. In that case, chop the fresh herbs into tiny pieces and add directly to the food, blending them thoroughly with the rest of the dried herbal formula. When using fresh garlic, you can use safely one clove per medium sized dog daily, and 1 to 2 teaspoons of fresh ginger, or more, if your dog tolerates its strong taste. ½ Tbsp per medium sized dog (30 to 50 lbs) twice a day. For small dogs feed half the amount. For large and giant dogs double the dosage. This amount lasts me exactly one week for four medium sized dogs. If you have a smaller dog, you may want to use half quantities so you have a fresh blend that doesn´t sit on your kitchen shelf for too long. You can add this dried herb blend into your dog´s food as is (be sure to mix it in thoroughly). Or, for an even greater benefit, you can infuse the herbs by putting them in a cup, pouring over a bit of boiling water, then cover it and let it steep for about 10 minutes. Then add the whole mixture to your dog´s food. This will make the beneficial properties more potent, and give your dog a nice warm meal as well! This herbal blend can be used any time you feel your dog needs an extra boost for his immune system.